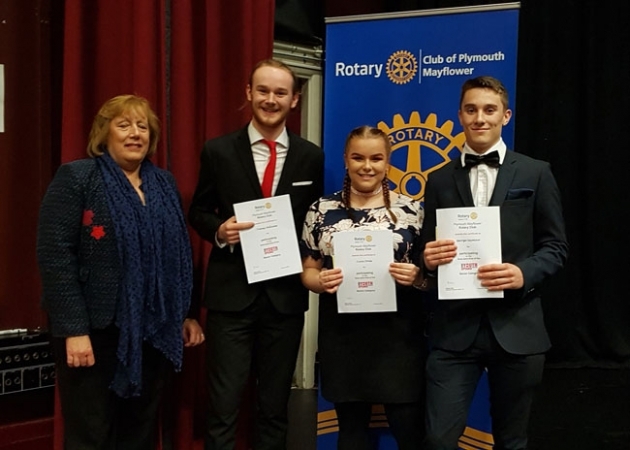 Saltash.net’s Sixth Form team have progressed to the District final of the Youth Speaks competition, where they will face schools from across Devon and Cornwall. In the District semi-final, the team of Lucie Jones (Chair), Tommy Williams (Main Speaker) and George Seymour (Vote of Thanks), all of whom are in Year 13, spoke on the importance of the Arts, covering how they are an important part of our culture, as well as elaborating on their numerous health benefits. The team explained how the Arts can help mental health; how they are scientifically proven to release endorphins and boost your health; how they can promote a platform or a voice for equality and how they prepare you for interviews and build your confidence. To demonstrate these points, Tommy performed a song as part of the speech to showcase the importance of the Arts. Judges noted that the team’s performance was superb and that they worked really well together, highlighting an important topic. Saltash.net was one of five schools competing, with the others being Devonport High School for Boys (who also proceeded to the next round), Plymouth High Schools for Girls, Heles School and Torquay Academy. English teacher Gemma Watson explained how proud she was of the team. “Not only did they perform with confidence and fluency, proceeding to the District final against some tough competition, but they showed unbelievable teamwork and friendship. They are incredible representatives of saltash.net community school,” she said. The District final will take place on March 23rd at Saltash Wesley Church, which will hopefully provide a home advantage for our team!